On Wednesday night’s final performance show, Candice whipped Kree like she stole something. Much like I wrote Wednesday night on the American Idol finale 2013, there have been some terrible voting decisions by America. There’s no way Lee DeWyze should’ve beat Crystal Bowersox. And in the worst one of all, there’s no way Kris Allen could hold Adam Lambert’s jockstrap in a suitcase. Thus, it’s plausible that Kree (who I’ve nicknamed Kreeyore for her sourpuss performance face) can win this show. Of course, if she did, it would mean America was deaf. 0:11 – After the final 12 did the customary group performance opener, The Band Perry started performing Done and you know who showed up to help out. If you said Bucky Covington, you’d be wrong. It was Janelle! 0:17 – Shots fired! After a slightly funny package about all the guys leaving early which ended up with Jordin Sparks pretending to mastermind it, she tells them that their future will be okay because Idol leftovers have been doing really well on The Voice. Zing! 0:20 – The top 5 boys perform a medley and Frankie Valli comes out to sing Can’t Take My Eyes Off Of You. Lauryn Hill must’ve been busy paying taxes tonight. 0:29 – Our girl Mariah performed a quick medley. It’s kind of what I’ve been waiting for all season long. 0:38 – American Idol loved them some Emeli Sandé this season. She and Amber Holcomb did a duet on stage. For some reason, Amber was wearing some camo stretch pants with gold heels. 0:53 – I’ve determined that Keith Urban is much more entertaining while bobbing his head and singing along to other’s performances than he is performing himself. 0:57 – Candice performed a Natalie Cole song with Jennifer Hudson and it was pretty cool to see them try to out-diva each other. Candice’s confidence is inspiring to see. 1:05 – Angie Miller and the great Adam Lambert performed Titanium. Lambert doesn’t get enough props for how big he got after Idol. He’s the forgotten Idol superstar. Jessie J, who is Angie’s idol, showed up and performed with Angie. Mariah threw out a look that said that she wasn’t quite into Jessie. 1:10 – After watching Angie have a blast on stage and be so charismatic, Kree must be wondering how the heck she made it to the final two. 1:21 – Not Keith Urban shredding, Randy Jackson on bass, or Travis Barker on drums could save Kree and her performance of Where The Blacktop Ends. 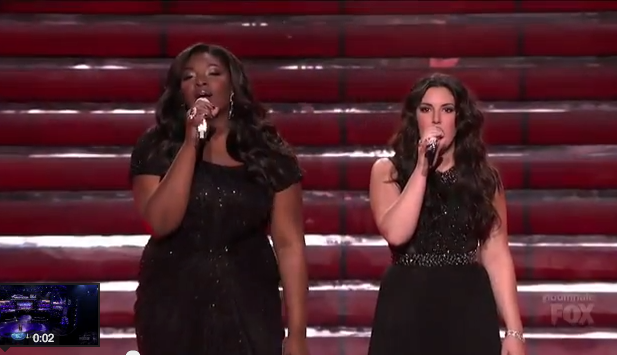 Kree is usually at a 3 and she ramped it up to a 5, but she needed to be a 10 on finale night. 1:32 – Aretha Franklin performed from New York while the top five girls sang backup. I think Aretha should’ve been on the diva showdown with J-Hud and Candice. 1:49 – Jennifer Lopez is a beautiful woman. Terrible singer, but beautiful woman. Pitbull is a terrible rapper. Terrible rapper, but terrible rapper. 2:01 – And the winner is…Kreeyore! Okay, just kidding. America wasn’t that dumb this year. One last Nicki gif for the season – will she be back?